The loadmaster’s garbled voice called through the bellowing engines of the C-17 early Sunday, his message clear enough: We were heading into Afghanistan. 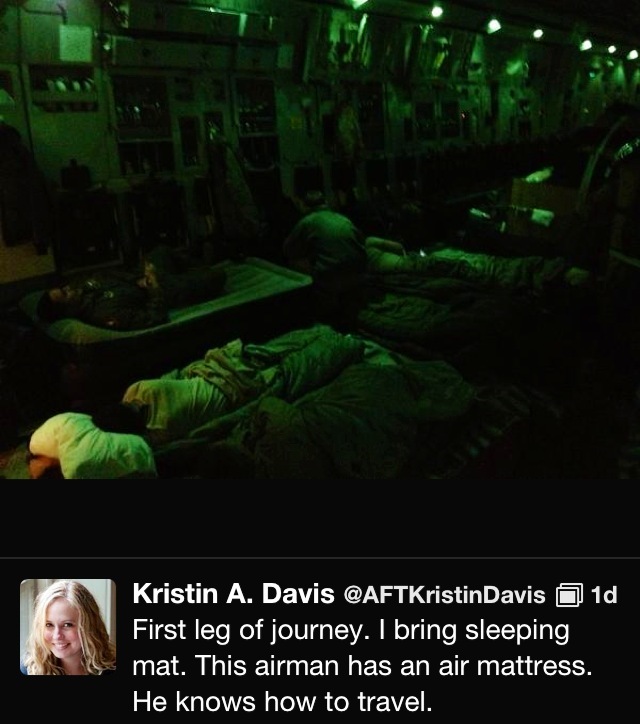 It was dark out, and had been for some time, making it impossible to see Bagram Airfield sprawling out below us through the small, round windows high in the belly of the cavernous aircraft. We’d left Dover Air Force Base, Del., a day earlier, hours after the historic meeting between President Obama and Afghan leader Hamid Karzai in Washington, DC, in which they discussed the drawdown of U.S. forces. In a few hours, Air Force Times photographer Colin Kelly and I will head to Kandahar Airfield, Afghanistan, where we hope to learn about the logistics of the move after a dozen years of war. It is still unclear exactly what role, if any, the U.S. will play after 2014. Perhaps a more nagging question: What will happen to Afghanistan once the foreign forces withdraw? I have heard two decidedly different answers to this in the last few hours, one from an airman stationed here at Bagram, and another with Army Lt. Col. Guy Moon, who is passing through the base after five months as in the officer-in-charge of agribusiness development in the Paktya province. During a brief and casual conversation, the airman shook his head at the mention of “drawdown.” To him, the word means risk – risk to him and his counterparts whose numbers will surely shrink. He worries about the increased danger to those who remain, particularly when they are outnumbered by Afghans. He nodded to the surrounding structures: the new PAX terminal and the USO Pat Tillman Memorial, built since the start of the war and on this night filled with U.S. troops slouched in oversized chairs, M-4s strapped to their chests while eating fresh popcorn and watching a movie on a big screen. “Two years,” he said, and it will all belong to the Taliban.